Azerbaijan has oil but, surprisingly, does not seem to have philatelists for its first Republic issues. Outside Azerbaijan, there are few serious collectors: readers don't come to this Blog looking for Azerbaijan. And the incredibly rare Blacksmith proof which was in the Corinphila sale this week (Lot 833, from me) did not sell. Part of the problem is that we have seen too many old and dirty copies of these stamps in schoolboy collections: tens of thousands of the unoverprinted first issues of 1919 - 21 went into Woolworth packets, many years ago. 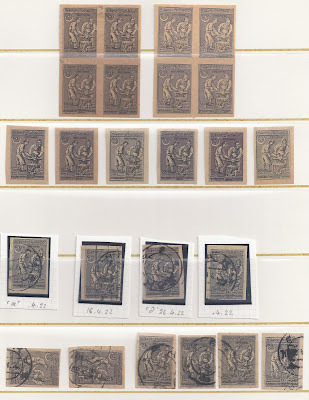 Another problem is the paper used for these stamps: newsprint is never attractive and it ages badly. Interestingly, when stamps have been gummed (either mint or used), the gum seems to help preserve the paper. But these stamps deserve a closer look. At the top on the left, a block of 4 of the 500r Blacksmiths of 1921. Someone has pencilled plating remarks and the paper has aged. On the right, the forgery of this stamp, not so common, and relatively easy to detect: the shading on the faces and shirts of the two smiths is less detailed, for example. The background colour wash on this stamp comes in many shades, some of them rare. I have lined up those I have in the second row. On the right, the last two stamps with purple and eggshell blue backgrounds could be colour trials - but I have no means of proving this. There is also some paper variation, though ageing complicates the picture. The third stamp from the left is clearly on a white paper. This stamp was not used for surcharging: the 150 rouble in the same design but in blue without colour wash background was used but not this 500r value. My accumulation of used copies is shown above. There are four with legible April 1922 dates in the top row and two with Janauary dates (laid sideways) in the bottom row. First, none of my used copies have a colour wash which is predominantly purple, violet or blue. All are basically grey. Second, all have BAKU cancels. This is a bit surprising since you would expect to see at least one from somewhere else, like ELISAVETPOL. Maybe this stamp was only available in Baku. Well, there's a Blog - perhaps the first ever - about just one value of this 15 value set. Someone could have a lot of fun making a specialised collection of all 15 stamps. But for the moment, I am just thinking that those two blacksmiths never expected to find themselves on the Internet.